She’s here! What a gift! It has been an amazing week— I met my mom in Keflavik on Wednesday and we spent the following four days traveling south to Seydisfjordur. It was nice to experience the road trip a second time, with more experienced eyes. There is so much to see here. I put together an initially for us that included visits to roaring waterfalls and glacial lagoons, as well as stops to explore the various agricultural technologies and traditions that are specific to each region. First, we stopped in a small fishing village north of Keflavik. Gardur sits on a peninsula, spotted with lighthouses and ancient shipwrecks. 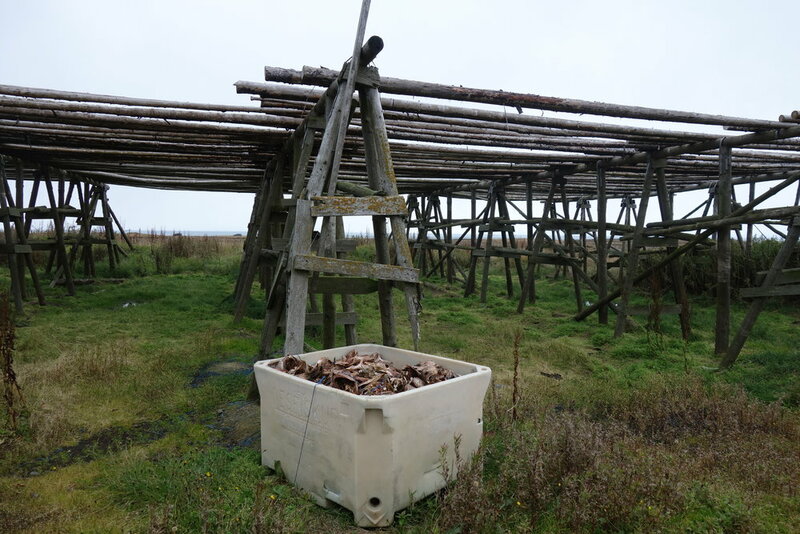 In the salty wind, there is a system of wooden racks set up to dry cod. The racks were empty, but the smell was still unmistakable. Buckets, placed at the end of the long structures, overflowed with dry cod heads. I found the structures so inspiring and interesting. 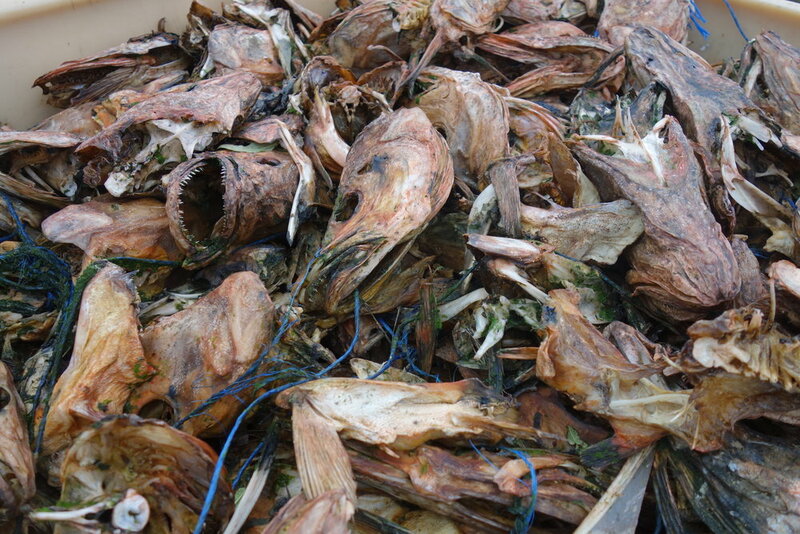 The smell was so strong, the fish heads were shocking, and the skeletal structures monumental. I wonder how my reaction may have differed if I had seen the fish drying from the structures, rather then seeing what is left over after having dried fish. We spent the evening in Reykjavik and visited Omnom Chocolate and Urta’s factories as well as Dill, in order to look at new technologies inspired by traditional Icelandic foods. At Omnom, we saw (imported) chocolate being made with Barley from Móðir Jörð, the farm I visited when I first arrived here. Urta uses local ingredients, many of which I have foraged, to make specialty salts. It seems obvious that salt would be easy to harvest in Iceland, a salt farmer could use the natural resources of the island to make salt with little fiscal strain- just a bucked of salt water thrown onto the geothermal rocks that steam all over the country (yes, this is a simplification, I just love the image). However, salt is a very new, and popular, “crop” here in Iceland. Less salt is being imported to the country as more and more salt factories have started to populate Iceland’s West Coast. At Dill, they pickle and preserve wild Icelandic edibles as well as root vegetables. The menu consisted of old Icelandic ingredients combined with new, high tech culinary trends. It was interesting to see that all three facilities were using new technologies to produce gourmet food in a uniquely Icelandic way, sharing ingredients such as barley (which has recently resurfaced in Iceland as a grain that is not just for livestock), Icelandic Thyme, Bilberries, dulse and more. My understanding is that in the North, particularly in the area around Reykjavik, young chefs and new companies are using new technologies and combining them with old recipes. As we traveled, we saw the trend continue in the West, we had Skyr and Blueberry beer from a brewer that uses glacial ice and geothermal sulfur, Bloody Marys made from Icelandic Vodka in a geothermal tomato greenhouse, and other blends of old and new traditions. “Started our drive eastward. We left Reykjavik and climbed up first though lave fields, then lava covered in moss (with clouds of steam rising), then to the same coved in snow and surrounded by snowy mountains. The geothermal heat rose in clouds all over the place, melting the snow in its path and revealing the greens and reds of moss and crow berries. It was so inspiring to see how the natural resources were used to make food that is specific to Iceland. Every environment we entered into felt like an installation. When you entered a space, you could smell it first, before you felt the change in temperature and humidity. When you enter, you step out of the cold wind and enter into a new climate with a distinct smell. This is all in addition to the beautiful arrangement of plants suspended inside of large, glass houses. I also remember the greenhouses as having the same skeleton as the drying racks used to make hardfiskur by the beach in Gardur. We also saw old techniques, like geothermal cooking. Unlike the earth ovens of Myvatn, that are buried in the ground, the systems in place here run above ground, piping geothermal energy from geysers to outdoor “stove tops” and large above ground ovens used to slow cook meats and breads. With every farm we visited, we would detour down long roads that would take us through farmland. It was refreshing and fun to look at a new landscape, together. We talked at length about the simplest things, normalities that are foreign to us that we found visually stimulating. When we turned off the road and drove through fields with colorful rolls of hay, we giggled with glee and called it a Good and Plenty installation. We both had no prior associations with these strange rolls of pink, mint and white that spotted the volcanic landscape and were able to share the playful experience of seeing something that is normal to others, for the first time. So many of my experiences here have been alone, or with someone who is from here. It was so nice to be able to share such a simple joy with her. We exited fields of lava to find Jökulsárlón and it’s landscape of glacial ice, that floats from the lagoon down to the sea. The glacial pieces flow down to the sea so quickly, like cargo ships, until they reach the salt water barrier- pushed backwards by the waves, eventually washed to the beach*. The precious, bright blue and white objects sit on the black lava sand, like moving glass sculptures. It was amazing to return here, the lagoon is always changing and I was reminded that you could come here every day and it would never be the same. *I am reminded of my algae cultivation here, and menu of fresh and salt water algae, inspired by a similar meeting point. The glacier water pushes fresh algae into the sea, where the two species intertwine and you find heaps of seaweed and spirulina on the beach. The shape of the topography barely changed as we moved from fields of lava to ice. “Our goal was to reach the Glacier Lagoon. And to make good headway in this journey. Across the road from the lagoon is Diamond Beach, our first stop. Everyone parks and runs sort of giddy towards the shore line where diamonds of all sizes are strewn along the black sand...and many more are bobbing quickly out to sea as the river from the lagoon opens up. It is compelling and hard to describe. As we drove and watched the landscape change from lava and moss, to snow and glaciers, to green fields under volcanic and fjord mountains. In each place, different technologies and traditions were used in response to the natural resources and demands of the landscape. In the East, we visited dairy and sheep farms, located under the dramatic mountains with glacier streams. As I stated earlier, in the west, a popular trend is to use new technologies to reinvent the Icelandic culinary identity by looking back at old foraging techniques and ancient grains. In the East, the diet is much different, and as a result, the agriculture is as well. Here, you are surrounded by fields of roaming sheep, horses and cows on one side, and fish farms on the other. The Icelandic food tradition is still deeply rooted in the consumption of meat and dairy as the primary, and often the only, source of nutrients. This is a result of the distance from Reykjavik and the need to preserve the culture, rather then reinvent it. Throughout my trip here, I have been inspired by the hostility and barrenness of this country, and the community that has been forced to rely on one another in order to survive. In dialog, I was told that a reason why many people in Iceland are not interested in native plants and their grandmother’s old cookbook recipes that call for Icelandic Moss, Dulce, Mushrooms and other edibles that grow on the landscapes, is the biproduct of American influence. During World War 2, thousands of Americans came to Iceland, overwelming the population and challenging the norms. 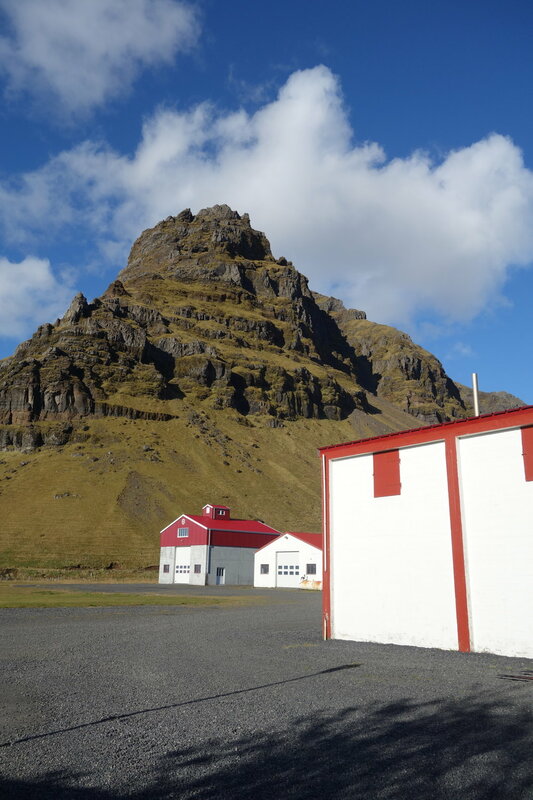 In Seydisfjordur alone, 2,000 American solders came to the small town, bringing with them American food and money. The icelandic’s felt poor and silly in comparison. After the war, as the Icelandic kronor grew in value and the country began to believe they could concure the world, the national identity changed as well. People wanted to eat lavish meals that showcased what the country had to offer. Moss and milk soup was ripped out of the recipes books and replaced by indulgent lamb and salmon dishes. It wasn’t until very recently that vegetables in Iceland expanded past roots and canned peas. One of my favorite memories was walking into a turf house to see smoking lamb. The house had been closed for the last few months while the lamb smoked, and conveniently, we were there when the door was opened and the smoked lamb was revealed. Entering into the space was visceral; I crouched down to get in, when I opened the door, smoke came out of the dark, cool space and I felt the smokey air, thick with birch and dung. 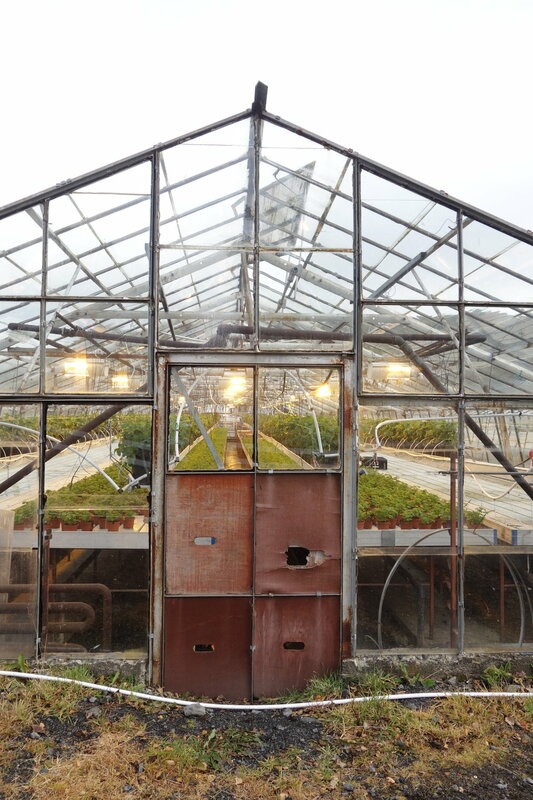 In the same way as the greenhouses, when I entered, I stepped into a different climate. Smell, heat, ground and light changed before I could look around at where I was, allowing my brain to attach connotations to these sensory stimuli from the simple motion of entering the space. So much of the food we saw was hung- from smoking meat, to salting cod, to the rows of hanging greenhouse crops- all of which were in engaging and immersive environments. The last trip we made was the Borgorfjordur, a neighboring fjord to the North. Again, we saw fish racks set up for air drying. In preparation for the winter, the cod had been removed from the racks, but rather then placing the heads into buckets, the fish heads of varying size were left in heaps, strung and dangling off the structure. In the center of the bridged structure, there was a shark tale, placed like an altarpiece in the center of the space. Driving with my mom, I learned to appreciate the horses here. As a hyper allergic member of a horse loving family, I have gotten used to keeping a safe distance from the animals. That being said, I loved watching my moms excitement every time we passed a horse, we saw hundreds over the course of her few days here. She told me that the Icelandic ponies are very unique, both in their mannerisms (they are very friendly) and in their postures and goofy anatomy. She went riding on her last day here and returned elated; she had “flown”! Some Icelandic ponies, used in competition, have a fifth gate that is called “flying”, a smooth gallop. After the horse ride, we concluded our trip with an Icelandic feast. A friend I have made in town invited us over for smoked lamb. When we arrived, Stefen pulled out a can of peas and said, “Normally we just have meat, but we have peas just for you!”. The meal was delicious: a leg of smoked, cooked lamb with scrambled eggs, slaw, peas, and a cream sauce (heated cream and flour). Very traditional. After writing this blog post, my mom sent me her notes on the trip, so I have included them alongside mine. It was so wonderful to see the country again with her and to share my temporary home with my mom.